Prior to joining the firm, Mr. Hamilton practiced law as in-house counsel for Cohu Electronics. Throughout his professional years, he was looked to for advice and endorsement on local, state, and federal judicial appointments and he was a trusted advisor to both the Nixon and Reagan administrations. Born in Kansas, he graduated from Southwestern College and received his law degree from Stanford Law School in 1937 at age 21. He then came to San Diego to practice law before joining the U.S. Navy reserve in 1939, and began active duty in 1941. During a distinguished military career, Mr. Hamilton was awarded three Bronze Star combat awards and was discharged in 1945. 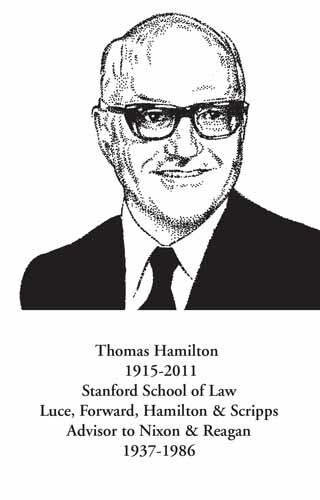 Committed to the ideals of justice, Mr. Hamilton served on the Board of Directors of the Pacific Legal Foundation from its inception in 1973 until 1986, serving as President for two terms. He served his profession as a member of the San Diego County Bar Association’s Board of Directors and was elected to serve as President in 1949. Though not a horseman himself, Mr. Hamilton was a dedicated steward of the Del Mar racetrack. He was on the Board and was legal counsel of the Del Mar Thoroughbred Club which took control of the racetrack in 1969. His many contributions to the community are evidenced by his service to the County Republican Committee, Chairman of Governor Reagan’s State Manpower Task-force, the Boards of Scripps institute, Salk Institute, University of San Diego, Campus Crusade for Christ and Executive Ministries.